The title is just about the sum total of my knowledge of French! Rather a useless phrase I think. However it refers to the 'quill ' of my aunt...an early use for feathers as writing implements. Recently I was in Don's house and in a room is a jar of large feathers from the wings of geese. Now his late wife did calligraphy and she used these quills, shaped, trimmed to give different effects to her writing. So I started to think of the uses to which feathers have been put through the ages. Early quilts and pillows were filled with feathers from plucked fowl destined for the pot. Down clothing is making a bit of a come back for outdoor wear and thankfully birds are not necessarily killed, but down is collected from large scale 'farms'. In earlier times, down was collected from nesting eiders ( after they'd abandoned the nests), steamed to clean them and used to line boots, hats and other outer wear. When I lived up north I had a down filled coat that was gorgeously warm...too hot at times ....but it was difficult to clean, requiring specialist methods. Birds use their plumage to great effect, to attract mates, specify their breed...and of course to delight us! Unfortunately when early travellers discovered exotic fowl like birds of paradise, they took back plumage. It didn't take long for fashion to catch onto the vibrant natural colours and wholesale slaughter began leading to the demise of these gentle and unafraid birds. Not only were the feathers used in hats...but stuffed birds appeared on some creations! 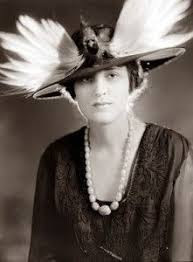 Such hats signified the standing of the lady within society. Nowadays we are more scandalized by the thought of destroying such lovely creatures. Well, we can watch programmes on TV showing us the plumage...on live birds. This provides an insight into the use that the birds put their plumage to. My niece in Canada belongs to an indiginous group (mi'kmaq nova scotia) and feathers play an important part in their dress, drums, headdress, accessories etc. She too believes that finding a tiny feather signifies that a passed loved one is close by. Whilst hillwalking I often come across feathers, say from a 'kill' or just shed from a live bird. Generally I pick up a couple and tuck them in my pocket or camera case and months later I come across them and recall the walk. Do take time and really look at feathers as the range of colours is absolutely amazing. I've had a really close look at pheasant's plumage and it is wonderful...words cannot express the wonder that I felt. I don't have any pieces specifically about feathers though I have,however,written many poems about birds. This week's contribution is about Lapwings and how they use their plumage to great affect whilst in flight. Won't you come and join us in our dance ? Fan-like wings that ride the air. A courtship dance to match a pair. Join us as we dance in sunlight. Calling, calling till the night. Come, come we're calling you. The poem is great - heard you read it a couple of times at events and it takes on an extra dimension in the performing. As for the hat - it's scary!